Washington (AFP) - Donald Trump was on the cusp of taking power as the 45th president of the United States Friday -- ushering in a new political era that has been cheered and feared in equal measure. "It all begins today! I will see you at 11:00 A.M. for the swearing-in. THE MOVEMENT CONTINUES - THE WORK BEGINS!" the Republican billionaire tweeted before observing a series of time-honored inauguration traditions. 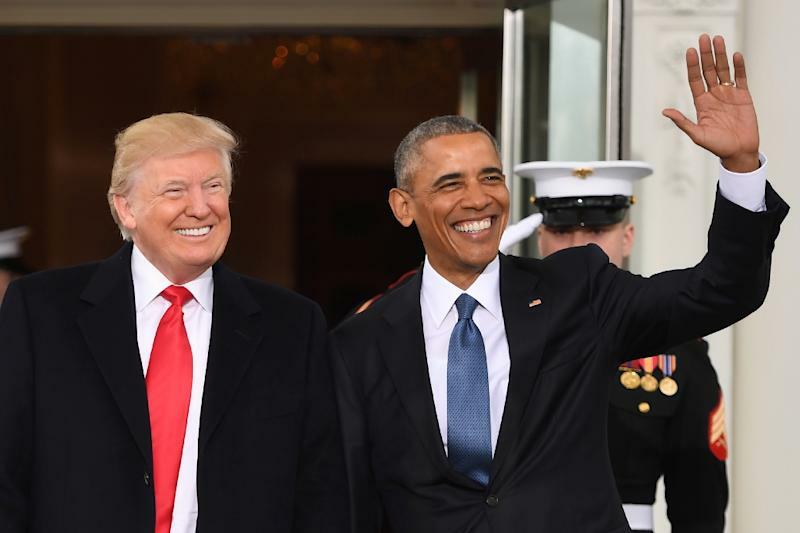 He attended a prayer service at St. John's Church before heading to the White House, where he was greeted warmly by President Barack Obama, capping a transfer of power that has been peaceful yet rancorous. 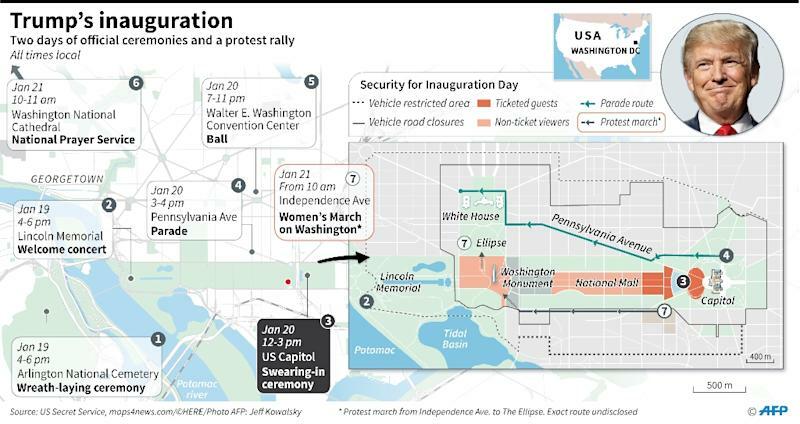 After morning tea, Trump, Obama and their wives Melania and Michelle traveled the 2.5 miles (four kilometers) down Pennsylvania Avenue to the swearing-in ceremony at the Capitol. Hundreds of thousands of people gathered on the National Mall in the center of the nation's capital to celebrate a man whose short 19-month political career has defied all predictions, and many norms. "I've been waiting for this for a long time," said Thomas Mendenhall, 68, a retired banker from Missouri. "We just want change." When Trump descended the escalators of his glitzy New York tower in June 2015, his run for office and his supporters were dismissed and even mocked. But shortly before midday Friday, Trump will place his hand on Abraham Lincoln's bible, recite the oath of office on the steps of the Capitol and become the most powerful man on earth. In the primaries, Trump dominated a crowded Republican presidential field with smash-mouth rhetoric and star power. He rode that same wave of anti-elite sentiment to victory over Democrat Hillary Clinton in the November election. At 70 years of age, he is the oldest man ever to begin work in the Oval Office. But the real estate mogul and one-time television reality star is also a political neophyte -- he will be the first president never to have held elected office, served in the government or the armed forces. For Trump's supporters, that is a central part of his appeal. "He's somebody that's not a politician" said 59-year-old Sandra Jackson-Carter, a salon owner from Bakersville, California. "He's going to unite the country and make America great again," she said. "This is history. There's nothing better." For his critics, Trump's arrival in Washington on Thursday onboard an Air Force jet was more like a hostile takeover than a traditional changing of the guard. Small demonstrations popped up across the city center on Friday, with shouts of "not my president" and "No Trump, No KKK, No fascist USA." Some tried to prevent Trump supporters from passing, but police intervened. Others threw stones and smashed windows, prompting police to use pepper spray. A much larger rally is planned for Saturday. Trump enters office with a 37 percent approval rating, the lowest on record, according to a CBS News poll. Most of Obama's White House staff have cleaned out their desks and the normally busy corridors of the West Wing were unusually quiet Friday. Staffers expressed relief at the prospect of rest, but foreboding about the road ahead. That sentiment is echoed across many of the world's capitals. Trump has vowed to tear up Obama's policies and re-examine decades-old alliances with Europe and in Asia. One of Obama's last acts in office was to speak to German Chancellor Angela Merkel, and declare trans-Atlantic ties vital for the world order -- a statement that would have been a banal platitude before this rocky transition. After promising to "faithfully execute the office of president of the United States" and "preserve, protect and defend the Constitution of the United States," Trump will deliver the most important speech of his life. 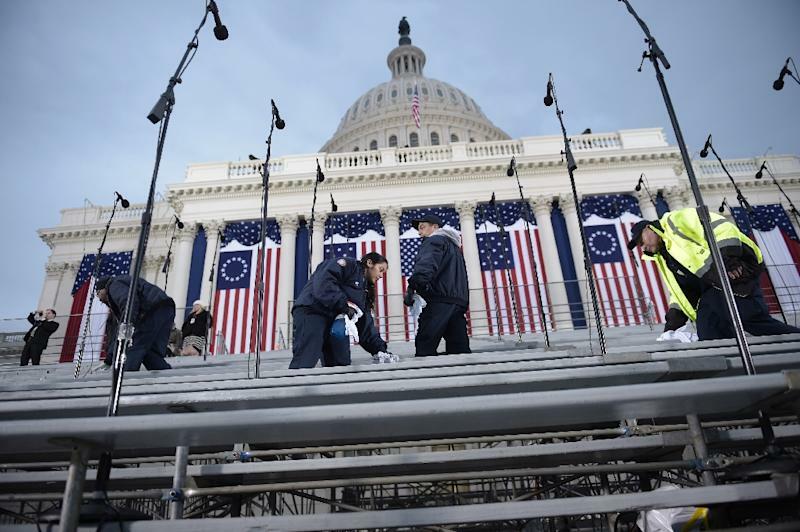 Inaugural addresses -- from Lincoln to John F. Kennedy -- echo across American history. Phrases like "malice towards none" and "ask not what your country can do for you" have been carved into the vernacular. The most noted inaugural addresses had sought to lift Americans' gaze up from the rancor and troubles of the day toward the horizon and a better tomorrow. Trump aides are promising an address that is at once short -- at around 20 minutes -- and philosophical. "It's going to be a very personal and sincere statement about his vision for the country," said incoming White House press secretary Sean Spicer. "He will discuss what it means to be an American, the challenges that we face," he said. "I think it's going to be less of an agenda and more of a philosophical document, a vision of where he sees the country, the proper role of government, the role of citizens."